Non-sterile, reusable, dual purpose punctal instrument that is double-ended. 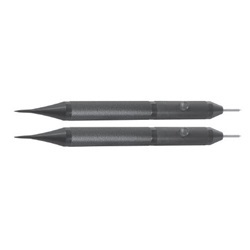 One end is used to insert a punctum plug and the other end can be utilized to dilate the puncta. For use with Beaver-Visitec non-sterile bulk and sterile quickload plugs. Manufactured by Beaver-Visitec. Comes two individually wrapped inserters per box.